At Thornley Fallis and 76design, our payroll costs routinely run at about 60% of our topline revenues. That means that 60 cents of every dollar we receive for our services goes directly to create jobs. Good jobs. Jobs that employ creative people. Jobs that employ knowledge workers. Workers who help companies – and government – use the new social media to create communities of interest, accelerate knowledge sharing and get closer to the people they serve. “There will be no free ride for anyone else in government either. “We are directing government ministers and deputy ministers from every single department and agency of the Government to rein in their spending on travel, hospitality, conferences, exchanges and professional services. Consulting. That’s me and my industry. The government contracts with knowledge workers as consultants. So, are we about to be on the chopping block? Does Minister Flaherty think that we are some kind of bureaucratic boondoggle? When I read Finance Minister Flaherty’s statement, I fear that he and the government are failing to see the value of the economic activity our industry generates. how government spending on communications not only is part of the solution in getting past the recession panic, but will also enable our industry to maintain employment levels. 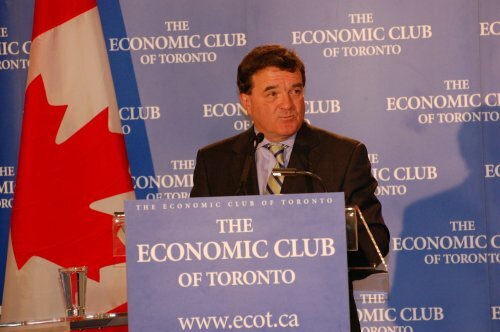 Does Minister Flaherty understand that if he takes a broadsword to consulting contracts, he will be killing jobs – lots of jobs – at a time when we should be trying to sustain employment? The Department of Finance announced last Thursday that it is conducting online consultations in advance of the January 26 budget. Mr. Flaherty, please don’t pull the rug out from under knowledge workers with one hand while with the other you are seeking to build up infrastructure. But while you are pouring dollars into building roads, bridges, buildings and bandwidth, please don’t undercut the knowledge workers whom you are counting on to use that infrastructure to create jobs in the future. People like me are trying to preserve jobs for knowledge workers. We aren’t getting any free ride. We help government to connect with Canadians. And we also help you to listen to what Canadians are saying. We are also very efficient at creating jobs. Jobs right here in Canada. We count on you and our government to be wise and to legislate in the public interest. So, please take a closer look at small business and industries like mine before you act. I think you’ll find that it makes sense to provide us with stability, not the back of your hand. And if you provide us with a stable environment, I’m sure you’ll find that we do our part. And isn’t that really how we’ll get through the recession? If everyone does their part?